East Coast German Wirehaired Pointer Rescue Inc. The German Wirehaired Pointer was developed in the late 19th Century and beginning of the 20th Century in Germany. The breeding origin is based on the ideas of "Hegewald" (Sigismund Freiherr von Zedlitz und Neukirch). It was carefully cross bred from the German Pointer and several other breeds. There is some differentiation on which breeds these were. It is speculated that they were Wirehaired Griffon, Poodle-Pointer, Foxhound, and Bloodhound. The German Wirehaired Pointer is the most popular dog in its country of origin, Germany. However, it was not officially recognized until the 1920's. At this time the dog was introduced to the United States. It was officially recognized in the United States in 1959. It has never grown to be as popular in the United States as it is in Germany. •	The German Wirehaired Pointer is very active and intelligent. •	Eager to learn and loyal to its family. •	Friendly with those it knows, but can be distant with strangers. •	Its hunting instincts lure it to roam. •	The GWP can become bored and hard to manage without enough exercise. •	A good all-around gundog, able to hunt any sort of game on any sort of terrain. •	Known for it's good nose and can track, point and retrieve on both land and water. It is steady, lively and vigorous. 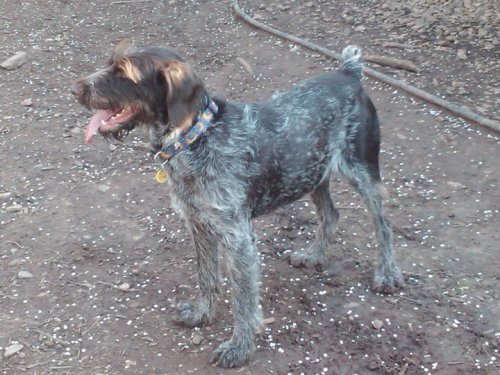 The German Wirehaired Pointer is a very intelligent, active, and affection breed. They like to keep busy and enjoy doing work for their owners. Without enough exercise of activity they can become very bored and hard to manage. It is important to keep them busy with tasks or involved in activities outdoors. This breed's puppies are very high energy and are very rambunctious. It is necessary to note that they are late bloomers and do not fully mature until two years old. They typically will excessively bark or destructively chew when they are bored or restless. This can be very aggravating for the owners. In addition to this, the German Wirehaired Pointer exhibit strong separation anxiety and do not like to be left alone for more than a few hours. If you work long hours or are away from home frequently, this is not the dog for you. Another thing to be aware of if choosing a puppy from this breed is that they do not house train easily. It takes several months of consistent and firm training for them to pick it up. They are very loyal family pets. However, they can become jealous. They make excellent watch dogs and are very protective of their owners. If the family has children, this dog may not be the best choice. This breed typically does better with older and considerate children. They are affectionate and loving towards their owners and remain very loyal. They can be dominant with other dogs and animals, but generally will do alright. They typically do well with other household animals, however, will tend to be dominant with other dogs in their homes. They need to be socialized from a young age because they tend to be a little bit aloof with strangers. Aloofness can turn into shyness which can be hard to handle when they are adult dogs. They do become attached to their owners and show tendencies of jealousy and these needs to be watched for. Early socialization can prevent or minimize this because it can show the dog that people and attention from other sources is not a threat. The German Wirehaired Pointer make great hunting companions. They are capable of hunting any kind of game on any kind of terrain. This breed is an excellent tracker with a strong nose. They can also track and retrieve on both land and water. They are steady, lively, and vigorous and this adds to their great hunting appeal because they do not tire easily. However, if being used for hunting and retrieving out in the brush and water it is necessary to make sure that their feet are checked afterwards to watch for debris. Grooming for the German Wirehaired Pointer is rated as being moderately low. They do shed and therefore require twice weekly brushing with a firm bristle brush. The German Wirehaired Pointer is a very high energy dog with a tireless nature. They need excessive amounts of exercise in order to not become bored and restless. They will become restless indoors and this can be bothersome. They are best suited for an owner or family who love the outdoors and can dedicate the time to running and keeping the dog occupied. This breed loves to go jogging, swim, and retrieve. This makes them an excellent dog for a family who loves to go to the lake or lives near the water. They were originally bred for the purpose of hunting and are still used for that purpose today. They will make wonderful companions for game hunters. Hunting will keep the dog feeling physically and mentally stimulated and will reduce the amount of indoor restlessness. Training for the German Wirehaired Pointer is essential. They need very consistent and firm training from the time they are young puppies. One of the most difficult parts of training for this breed is house breaking. The two keys to housebreaking are confinement and regular access to the right place to go to the bathroom. Confinement means that until your dog is house broken they are not allowed to roam freely around the house. The dog should be confined when ever you are not playing, grooming, walking, cuddling, or occupying the dog in any other way. If the dog is allowed to roam free around the house and you are not watching they will go to the bathroom in the house and then the bad habit has started. There are three different types of confinement. First the dog can be put in a crate and let outside frequently. Secondly, the dog can be put in a pen with a litter box or newspapers. Lastly, the dog can be kept in a small room and they can have regular access outside through a doggie door. This way they can control when they go outside. Having access to the right place to go means take your dog outside. It is important that your dog has a place to go on a regular basis. This can be outside or it can also be newspaper or litter box at the beginning. Another essential element for the training of the German Wirehaired Pointer is socialization. The best socialization occurs between when the puppy is 7 weeks old until about 6 months old. That is the time to take the dog out into the world to experience new people and new places. This will help the dog become less aloof an suspicious. Socialization should continue throughout the dog's adolescent years because like teenagers the dog's attitude can change monthly or even daily. It is important to keep introducing your dog to new things. Adult socialization is almost impossible because by that time the dog has already determined its personality and attitudes. It can be very difficult to try and change that during adulthood. The German Wirehaired Pointer because it is a sporting and hunting dog can also receive training for that purpose. There are several agencies and training programs to assist in the training of both the dog and owner. They will excel in agility, hunting, tracking, and retrieving. Getting the dog involved in agility training is a great way to occupy the dog both mentally and physically.